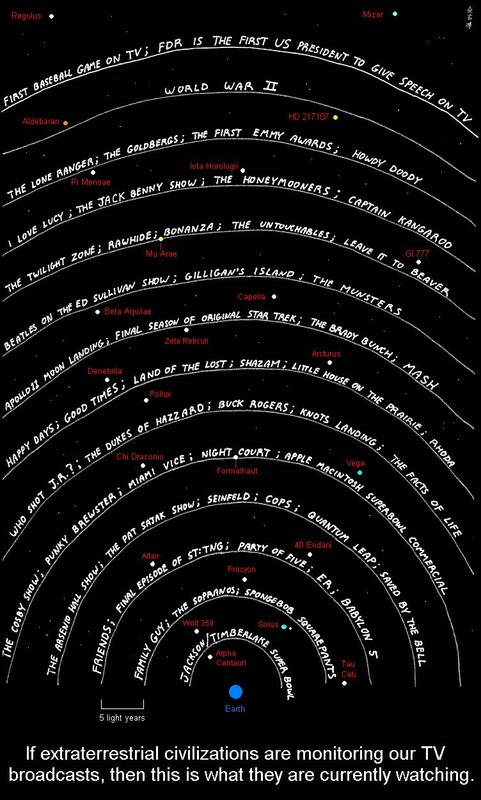 In the movie Contact, astronomers receive a radio signal from the star Vega. Buried within the signal is a broadcast of Hitler’s speech for the opening of the 1936 Olympic games. The television signal had made the 25 light year journey to Vega, which let the aliens know we’re here. The idea that our television and radio signals are gradually reaching ever more distant stars is a popular one, but in reality things aren’t so simple. The opening ceremony of the 1936 Olympics was the first major television signal at a frequency high enough to penetrate Earth’s ionosphere. From there you could calculate that any star within about 80 light years of Earth could detect our presence. There’s even a website that shows which TV shows might be reaching potentially habitable worlds. But the problem with this idea is that it isn’t good enough for the signal to reach a distant star, it also needs to be powerful and clear enough to be detectable. For example, the most distant human-made object is Voyager I, which has a transmission power of about 23 Watts, and is still detectable by radio telescopes 125 AU away. Proxima Centauri, the closest star to the Sun, is about 2,200 times more distant. Since the strength of a light signal decreases with distance following the inverse square relation, one would need a transmission power of more than 110 million Watts to transmit a signal to Proxima Centauri with the strength of Voyager to Earth. Current TV broadcasts (at least in the States) is limited to around 5 million Watts for UHF stations, and many stations aren’t nearly that powerful. One might argue that an advanced alien civilization would surely have more advanced detectors than we currently have, so a weaker signal isn’t a huge problem. However the television signals we transmit aren’t targeted at space. Some of the signal does leak out into space, but they aren’t specifically aimed at a stellar target the way Voyager I’s signal is aimed at Earth. They also lack a clear mechanism for how transform the signal to an image. On Earth this works by implementing a specific standard, which any alien civilization would need to reverse engineer to really watch TV. On top of that, there is the problem of scattering and absorption of the signal by interstellar gas and dust. This can diminish the power and distort the signal. Even if aliens could detect our signals, they might still confuse it with background noise. A color-coded version of the Arecibo message. That doesn’t mean it’s impossible to communicate between stars. It just means that communication would require an intentional effort on both sides. If you really want to communicate with aliens, you need to make sure your signal is both clear and readable. To make it stand out among all the electromagnetic noise in the universe, you’d want to choose a wavelength were things are relatively quiet. One good region is known as the water hole, which spans a range from 18 to 21 cm. Hydrogen (H) emits at about 21 cm, and hydroxyl (HO) has a strong emission at about 18 cm. Together they can form water, hence the name for the quite gap in between. You also need to make your signal easy to recognize as an artificial signal. In Contact the aliens did this by transmitting a series of prime numbers. In 1974 humanity made its most famous effort to send a signal to the stars. It was a radio transmission sent from the Arecibo observatory, and consisted of 1,679 binary digits, lasting three minutes. Since 1,679 is the product of the primes 23 and 73, the bits can be arranged into an image of those dimensions. There have been other efforts to send messages to the stars, but they haven’t been as powerful or as simple. Beyond a few light years, our leaky TV broadcasts are likely undetectable. As we’ve switched to digital television and lower transmission powers they’ve become even harder to detect. Any aliens looking for us will have to rely on other bits of evidence, such as the indication of water in our atmosphere or chlorophyl on Earth’s surface, just as we will strive to detect such things on distant worlds. Either way, the first message received won’t be a complex text of information. It will simply be a recognition of life on another world.